It’s quite rare to consider Arsenal as a “clutch” team considering how little they have to show in terms of trophies these last ten years, but according to Opta, when the Gunners play at home almost all of their goals come in the final 30 minutes of matches. Alexis Sanchez scoring in the 89th minute to give them a 1-0 win over Southampton in the midweek round of matches was just another part of a weird season that hasn’t being going too well, but the form of Sanchez and a few late wins while being in contention for fourth or even third place, which is where Arsenal always end up, is keeping the optimism at a high among many. The season began with Aaron Ramsey scoring a 91st minute goal to beat Crystal Palace, and two goals in the final 30 minutes of the home draw with Manchester City gave them a brief lead. Alex Oxlade-Chamberlain saved them a point with a 74th minute goal in the home draw against Tottenham, and a 91st minute goal from Danny Welbeck against Hull City saved them from losing at home. In their 3-0 win over Burnley all the goals came in the final 20 minutes of the match, in their home loss to Manchester United Olivier Giroud scored in the 95th minute which didn’t change anything and now against Southampton. What’s the conclusion? 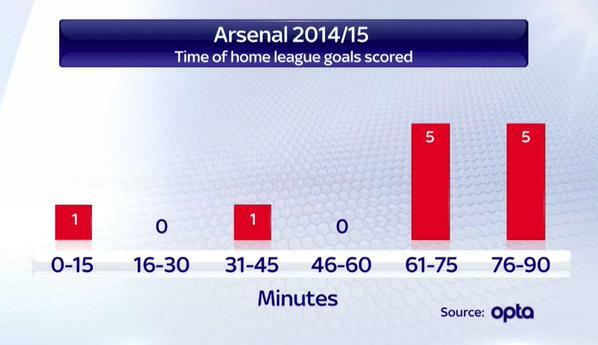 Arsenal don’t give up, but that’s a bit simplistic. Above all else, it might suggest that Wenger picks the wrong lineup every time, and only after making changes in the second half combined with the urgency of salvaging a point or three with the backing of the fans brings out these results.